"Northern Rail, on all their stations, impose a smoking and vaping ban, including on open platforms. Apparently it's against 'by-laws' ", (from an email sent to us). 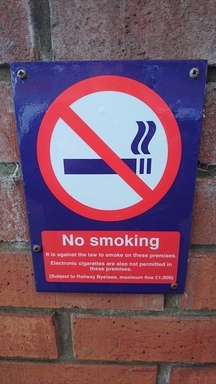 NNA has emailed Northern Rail to complain, both about the signage and the prohibition of vaping on open platforms. 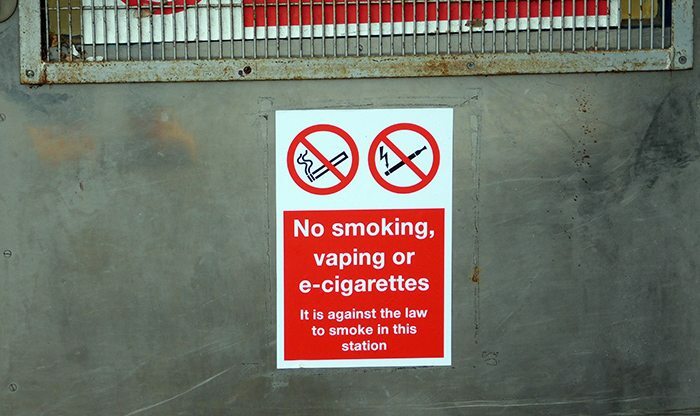 Vaping is NOT included in the railway by-laws. 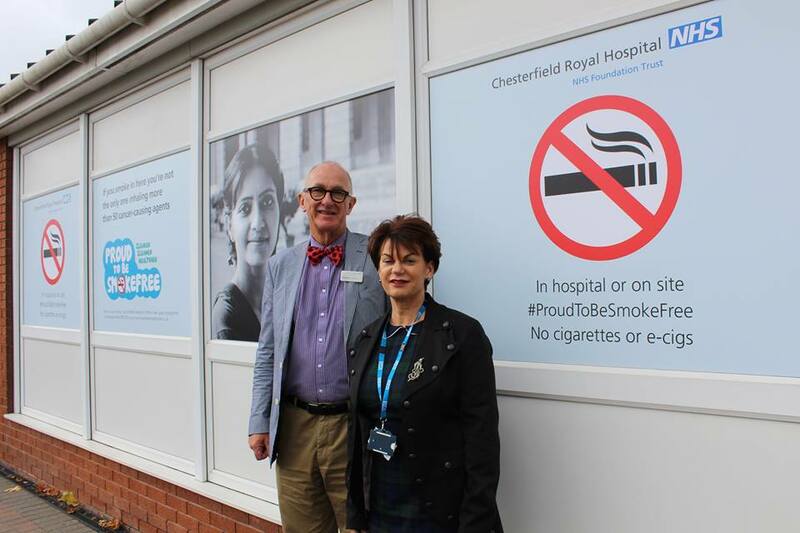 "I shall be adding my local Chiltern Railways train station in Leamington Spa as soon as I can because despite being open to the elements ‘electronic cigarettes‘ are banned AND lumped in with the NO Smoking ban." NNA has now emailed Chiltern Railways to complain. Local authorities: In November 2017 the Freedom to Vape campaign published its second annual report on local councils' policies on staff using e-cigarettes, read it here. The report shows ​that the​ ​vast​ ​majority​ ​of​ ​councils​ ​are ignoring​ ​the​ ​advice​ ​of​ ​respected​ ​bodies​ ​like​ ​Public Health England and the ​Royal​ ​College​ ​of​ ​Physicians. Wetherspoons has banned vaping in all areas where smoking is banned, even in outside areas. This curiosity can be found in Ye Old Cheshire Cheese in Fleet Street, London. The sign reads: "The use of inhalators or artificial cigarettes are (sic) not allowed in this pub"
DFDS Seaways restricts vaping to smoking areas only - this includes outside, on the windy decks. "Smoking, which includes e-cigarettes" roughly translates to: "we can't be bothered to think about vaping so let's just treat it like smoking". Many companies do this, not just DFDS. Darent Valley Hospital has banned both smoking and vaping throughout its grounds. The ban was brought in to mark the start of their Stoptober campaign - despite the national 2017 Stoptober campaign's support for e-cigarettes. "(...) that e-cigarette use is not covered by smokefree legislation and should not routinely be included in the requirements of an organisation’s smokefree policy. " 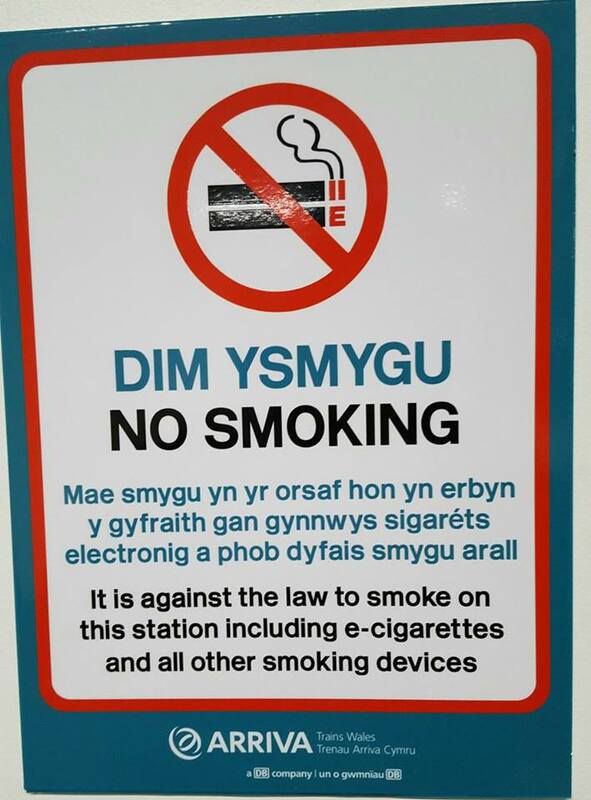 Arriva Trains Wales displays this sign on their stations. A similar sign is posted on their buses, which states: "it is against the law to smoke on this bus including the use of electronic cigarettes". This is, of course, false as vaping is not included in anti smoking legislation. 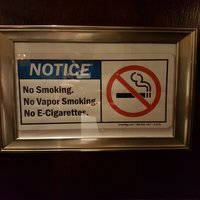 If it is against their company policy to allow vaping then the signage needs to state this. 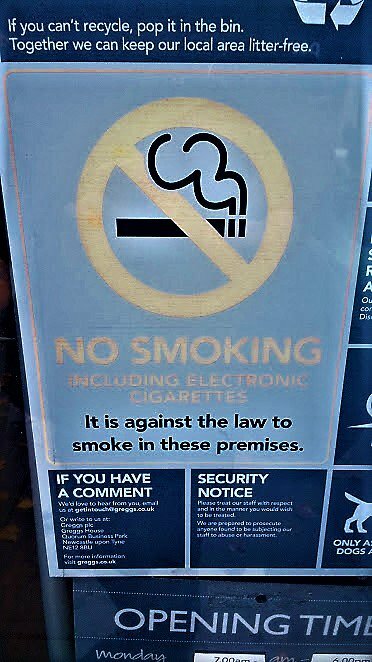 The Greggs no-smoking sign states: "NO SMOKING including electronic cigarettes It is against the law to smoke in these premises". Again, this is very inaccurate - vaping isn't smoking and it isn't illegal to use an electronic cigarette inside a store. These signs are all over the London underground. TFL needs to be told that vaping isn't smoking and you cannot "smoke" an e-cigarette. Conflating vaping with smoking keeps people smoking. These signs are misleading and irresponsible.